How do you know which bit is best for you and your horse? What is the purpose of all these different style of bits? It feels like there are 1000’s of bits to choose from and it can be overwhelming. There are a few things to take into consideration when looking at a bit for your horse. One of these is your horse’s mouth. Some horses have a thicker tongue and a lower roof of the mouth and others have a bit more room for the bit to comfortably sit. If you horse doesn’t have a lot of room for the bit then they can be a bit more fussy about what is comfortable. Some horses like a bit of tongue pressure and others want tongue relief when working with a bit. You will find that out when you start working them. Horses that are fussy with the bit, chewing and chewing, gaping their mouths when you apply pressure, or constantly put their tongue over the bit may need some tongue relief. Another thing to think about is what each mouthpiece is designed to do when pressure is applied. It’s important to understand what is going on when you lift your reins. Let’s look at the snaffle bit first. The snaffle bit with a single break seems to be the bit I see the most. It is thought to be a very kind bit and easily accepted by most horses. The thicker the mouth piece the kinder the bit. The narrower the mouth piece the sharper the contact will be. 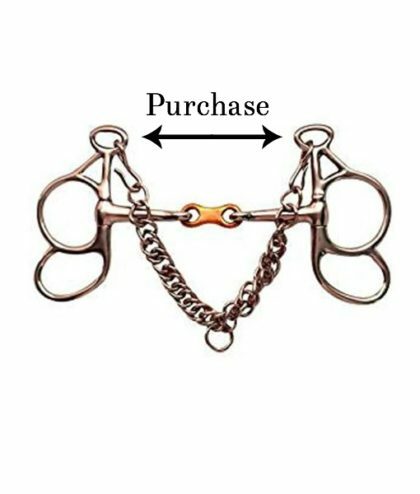 The snaffle is designed to sit on the horse’s tongue when there is no pressure applied. When you pick up the reins the break will push forward, toward the front of the horse’s mouth and apply pressure to the bars of the mouth and squeeze the tongue. If the reins are drawn downward the break will move up and can bang the horse on the roof of the mouth, then the horse will most likely raise it’s head to avoid the bit. If your horse has a small space because of a larger tongue or a low roof of the mouth the single break can also bang them in the roof of the mouth. 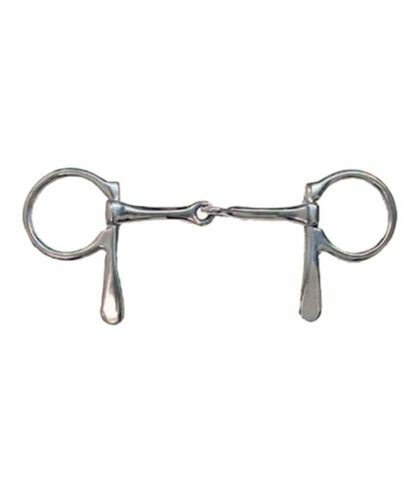 The snaffle with a double break or a french link can fit a bit better in a mouth that doesn’t have room for the bit with a single break. 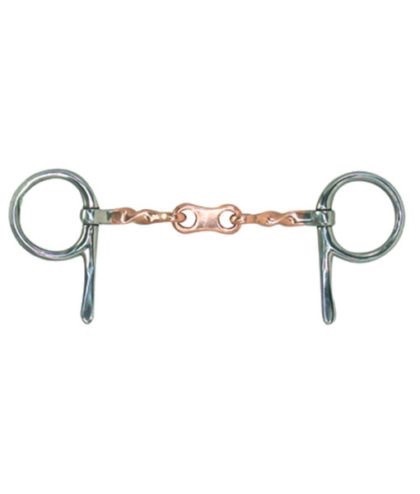 This type of snaffle will lay on the tongue and apply pressure to the bars of the mouth when the reins are picked up, but will not squeeze the tongue very much. 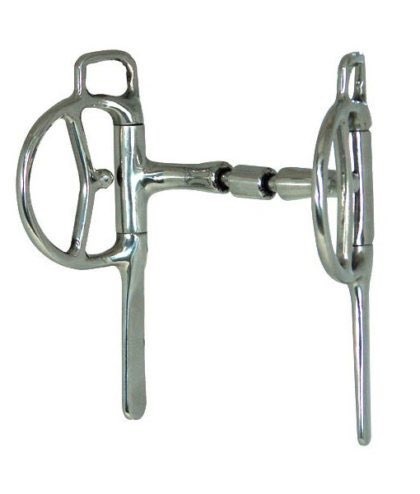 Some horses will play with the french link style of snaffle a bit more because the mouthpiece is so mobile. 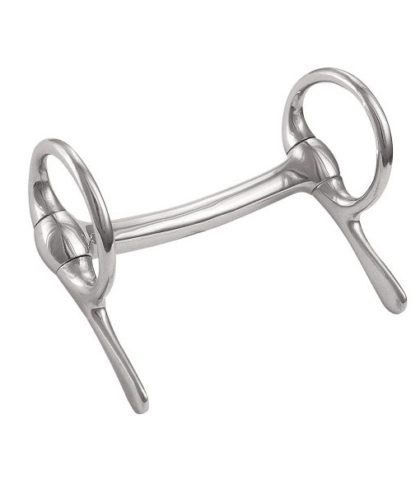 The mullen mouth snaffle is wonderful for horses with a larger tongue and low roof of the mouth. Depending on how the mouth piece is shaped the mullen mouth can also allow for some tongue relief. This style of mullen mouth will lay on the horse’s tongue and when the reins are lifted pressure will be applied to the bars of the mouth. 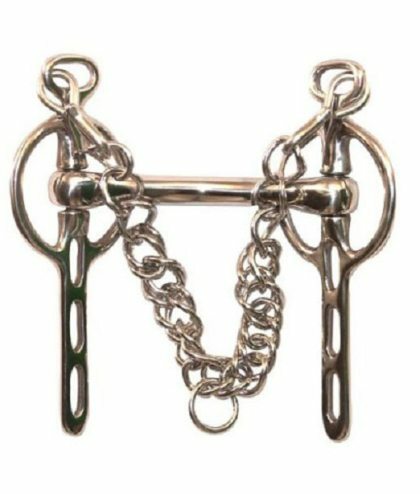 The Half Cheek Roller Mouth snaffle/mullen mouth will allow for a certain amount of tongue relief as the bit is shaped to the horse’s mouth. It also has a roller in the center for the fidgety horse. 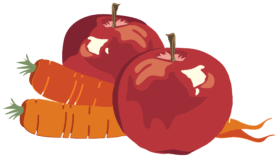 This can have a calming effect on those that have very active mouths. The mouth piece is a bit narrower and will fit in the small mouth of the miniature horse very well, but will allow for a more sharper connection when you lift the reins. Now onto the Butterfly bit. There are a few different mouth pieces that you can get with this style of bit. The Butterfly bit is a curb action bit meaning that there will be some leverage applied when the reins are lifted. The curb style bits have a purchase- where the bridle attaches to the bit. There is a curb strap that goes under the chin and the reins can be attached to any of the loops on the cheek piece. A butterfly bit will usually have two or three loops. The double break or french link mouth piece will have less tongue pressure as it will squeeze the tongue less but you will have quite a bit of leverage. The lower you place the reins on the loops the more leverage you will have. The curb style bits will apply rotational force when the reins are lifted. The tighter the curb strap the more force will be applied. It is thought that because the driving bridle is already so much heavier than a riding bridle, due to the blinders, the pressure applied to the poll when using a curb style bit on a driving bridle, is minimal compared to the weight of the bridle itself. Even if you attach the reins to the side cheek pieces you will still have leverage and rotational pull when you pick up the reins due to the purchase and the curb strap. When you use a Butterfly bit, or any curb style bit, with a port in the mouth piece be sure that there is enough room in your horse’s mouth to accommodate the port. The port is there to effect some tongue relief, but can bang into the roof of the horse’s mouth if there isn’t enough room. All this applies to the Liverpool style of curb bit as well. With the Liverpool bits there are more rein attachments on the cheek pieces which will allow for more leverage. You can attach your reins to the cheek of the Liverpool. The next slot will allow for a bit more leverage, working your way down to the last slot which allows for the maximum amount of leverage… if you need to have your reins on this slot then you have a training problem not a bit problem. 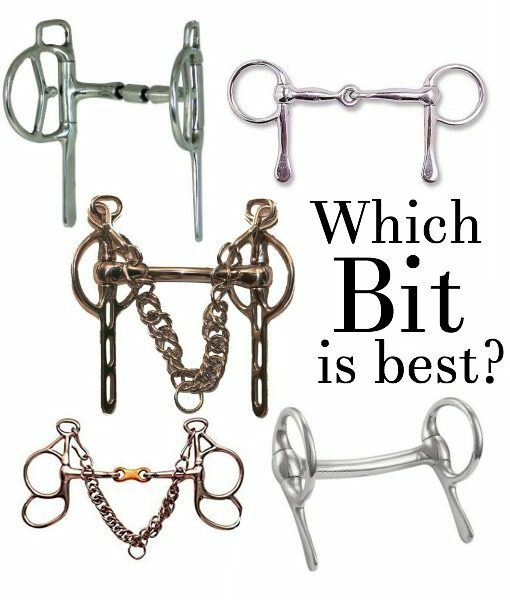 Hopefully this will give you a bit more information to go one when choosing the proper bit for your horse. You may find that you need to try out a few different ones before you hit on the exact right fit, but for the safety and comfort of both you and your horse, it’s worth it! This entry was posted in Uncategorized and tagged bits, butterfly bit, driving bits, liverpool bit, snaffle bit.